Anyone who lives around the Western District will have noticed Kennedy Town’s relentless desire to become Hong Kong Island’s next coolest neighbourhood. Hardly a week goes by without something new appearing on the main streets and in the side alleys. Coffee shops, Western eateries, pizza joints, boutique stores – the whole area is beginning to kick off. But what K-Town could do with most is a few more bars. Davis Street is still the go-to-place for weeknight beers – but it takes a brave mind (and a deep wallet?) to branch out to other parts. 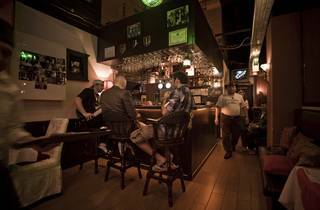 We know of an as-yet-unnamed bar which has just opened across the waterfront (near Manhattan Heights), which our spies tell us will be called K-West (or Quay West), but other than that, it’s the enclave of ‘little LKF’ (Davis Street) which most K-Towners migrate towards. But not any more. Retro Bar has just opened on Catchick Street, a few doors up from The Clay Oven curry house. 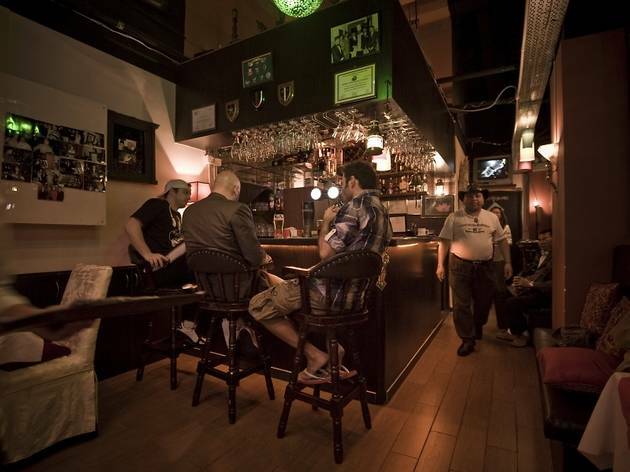 They’re calling themselves ‘the first restro bar in Kennedy Town’ and you can’t miss it – they have glittering white fairy lights sprinkled across the entrance and two smoking/drinking tables overlooking the doors. This used to be Kathmandu Grill & Bar but one suspects the ‘call of the curry’ had slowly beaten the Nepalese eatery into submission; hence the reincarnation into Retro Bar. You can still order Nepalese fare here but the menu has changed radically to include a mixture of Western and Eastern cuisines. It’s a bold move but we don’t want talk about the grub; we want to know if Retro Bar is a decent place to drink. The answer? Defo. The Nepalese boss of Retro Bar, Shiva Bahadur, has gone all out to draw the crowd away from Davis Street. His bar offers happy hour on Monday, Tuesday and Wednesday until 8pm, all-night discounts for nearby uni students on Thursday, and Saturday evening DJ nights.